Sonja Lokar is a Slovenian freelance expert for gender equality, Chair of the Gender Task Force, a South East European regional initiative, president of the European Women´s Lobby. She is also Member of the European Commission experts’ network of women in political and economic decision making LP Westminster Foundation consultant and mediator in the OSCE Serbia and Kosovo Missions. Her background includes a number of tailored trainings, as well as mentoring and coaching programs regarding gender issues, civil society and capacity building of women activists and politicians. More recently, she has been an NDI consultant for Tunisian and Moroccan women activists from different political parties, as well as member of the NDI international observation mission of the first free elections in Tunisia, and has taken part in the process of establishing “Women’s Academy for Africa”, in Maputo, Mozambique. 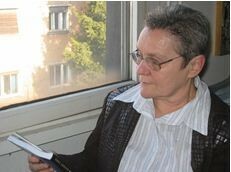 Her expertise includes creation and implementation of national and international projects on gender equality (in Slovenia, and in 32 different, mostly transition countries) for women members of left wing political parties, and women from all walks of life and from all political backgrounds. She holds a degree in Franc Language and a degree in Sociology from Ljubljana University.